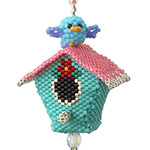 With warm weather just around the corner this brand new 3D bird house ornament pattern from ThreadABead.com has such a summery feel, and look who has moved in - two of the most adorable little beaded blue birds looking at home already! This little ornament would make an excellent gift for your friends who are celebrating summer time birthdays this year. Made using Round Peyote and Odd Count Peyote the house takes around 8 hours to bead. As usual with ThreadABead featured patterns we give full detailed photographic instructions and in this pattern there are 90 detailed steps, making this pattern even suitable for beginners to beading. Please note the pattern may not work with any other size and type of beads. There are 10 colours in total and the finished beadwork is approximately 3.5cm (w) x 2.75(d) x 15 (h) cm (including loop) Wadding is optional and a no tangle thread bobbin is useful. The bead pattern supplied is 28 pages and includes a full colour step by step photo instructions and coloured pattern chart where needed.